Get your fish monger to slice up a thick piece (about one inch thick) of line caught, sustainable tuna. For the marinade, mix in a sauce pan on medium heat, the dark soy, sugar, sherry vinegar and ginger. Always master to your taste of sweet, sour and salty and adjust accordingly adding more sugar if its too salty, more vinegar if its too sweet. (This should not come to the boil or become too hot, I put it on a heat so that the sugar dissolves. Remove from heat once the sugar dissolves). 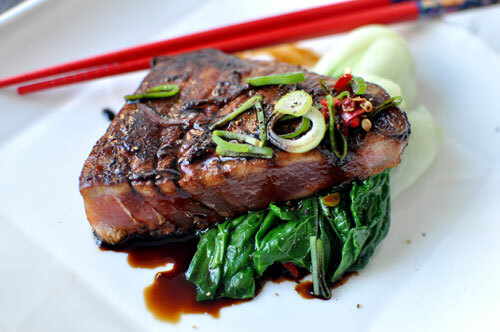 Cool down and pour the marinade over the tuna and marinade for 10 mins or more. For the pak choi, pour boiling water over the vegetable in a bowl to blanch, then drain. Place on a plate. Chop the shallots and sweat off in a sauce pan with some oil. Sear the marinaded tuna for about 2 mins on each side and more if you prefer your fish well done. Rest the fish on a chopping board for a couple of minutes and slice the steak into two. One slice per person. Place on plate on top of the pak choi and season with black pepper, spring onions and chilli. Pour over juices from the pan. Serve as it is or with rice or noodles. Its not very Chinese, but this is great with mash too!